It's been 165 years since Congress passed an act to establish the Smithsonian Institution. Dubbed the 'Nation's Attic' (or 'America's Attic'), it has since become a prolific entity. We decided to go looking for some of the more eccentric items collected by the Smithsonian, many of which are currently on view. You may get to see some of these when you visit Washington, D.C., with Discovery Student Adventures. 5 cool, albeit odd things you can see at the Smithsonian. 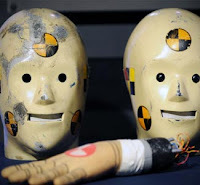 Crash-test dummies. Vince and Larry endured countless crashes and made some funny commercials to get people to wear their seatbelts. The gear from the famous duo was donated to this museum. Dorothy’s ruby slippers. There's no place like home, at the Smithsonian. The iconic shoes from 'The Wizard of Oz', are one of this museum's main attractions. The glittering red slippers are worn around the edges, a reminder of all the clicking and dancing they endured. Teddy Roosevelt’s teddy bear. This prized possession is the original teddy bear, given to this president after a particular bear-hunting story made its way around. The incident also inspired a popular political cartoon. Harry Truman’s bowling pin. President Harry Truman had a two-lane bowling alley installed in the White House and helped create a White House bowling league. ‘Star Trek’ phaser. Trekkies will delight in seeing weaponry from the classic '60s TV show at this museum.